"Rømer" redirects here. For other uses, see Romer (disambiguation). Ole Christensen Rømer (Danish: [ˈo(ː)lə ˈʁœːˀmɐ]; 25 September 1644 – 19 September 1710) was a Danish astronomer who, in 1676, made the first quantitative measurements of the speed of light. In scientific literature, alternative spellings such as "Roemer", "Römer", or "Romer" are common. Rømer was born on 25 September 1644 in Århus to merchant and skipper Christen Pedersen (died 1663), and Anna Olufsdatter Storm (c. 1610 – 1690), daughter of a well-to-do alderman. Since 1642, Christen Pedersen had taken to using the name Rømer, which means that he was from the Danish island of Rømø, to distinguish himself from a couple of other people named Christen Pedersen. There are few records of Ole Rømer before 1662, when he graduated from the old Aarhus Katedralskole (the Cathedral school of Aarhus), moved to Copenhagen and matriculated at the University of Copenhagen. His mentor at the University was Rasmus Bartholin, who published his discovery of the double refraction of a light ray by Iceland spar (calcite) in 1668, while Rømer was living in his home. Rømer was given every opportunity to learn mathematics and astronomy using Tycho Brahe's astronomical observations, as Bartholin had been given the task of preparing them for publication. Rømer was employed by the French government: Louis XIV made him tutor for the Dauphin, and he also took part in the construction of the magnificent fountains at Versailles. In 1681, Rømer returned to Denmark and was appointed professor of astronomy at the University of Copenhagen, and the same year he married Anne Marie Bartholin, the daughter of Rasmus Bartholin. He was active also as an observer, both at the University Observatory at Rundetårn and in his home, using improved instruments of his own construction. Unfortunately, his observations have not survived: they were lost in the great Copenhagen Fire of 1728. However, a former assistant (and later an astronomer in his own right), Peder Horrebow, loyally described and wrote about Rømer's observations. In Rømer's position as royal mathematician, he introduced the first national system for weights and measures in Denmark on 1 May 1683. Initially based on the Rhine foot, a more accurate national standard was adopted in 1698. Later measurements of the standards fabricated for length and volume show an excellent degree of accuracy. His goal was to achieve a definition based on astronomical constants, using a pendulum. This would happen after his death, practicalities making it too inaccurate at the time. Notable is also his definition of the new Danish mile of 24,000 Danish feet (circa 7,532 m). In 1700, Rømer persuaded the king to introduce the Gregorian calendar in Denmark-Norway – something Tycho Brahe had argued for in vain a hundred years earlier. Rømer developed one of the first temperature scales while convalescing from a broken leg. Fahrenheit visited him in 1708 and improved on the Rømer scale, the result being the familiar Fahrenheit temperature scale still in use today in a few countries. Rømer also established navigation schools in several Danish cities. In 1705, Rømer was made the second Chief of the Copenhagen Police, a position he kept until his death in 1710. As one of his first acts, he fired the entire force, being convinced that the morale was alarmingly low. He was the inventor of the first street lights (oil lamps) in Copenhagen, and worked hard to try to control the beggars, poor people, unemployed, and prostitutes of Copenhagen. In Copenhagen, Rømer made rules for building new houses, got the city's water supply and sewers back in order, ensured that the city's fire department got new and better equipment, and was the moving force behind the planning and making of new pavement in the streets and on the city squares. Rømer died at the age of 65 in 1710. He was buried in Copenhagen Cathedral, which has since been rebuilt following its destruction in the Battle of Copenhagen (1807). There is a modern memorial. The determination of longitude is a significant practical problem in cartography and navigation. Philip III of Spain offered a prize for a method to determine the longitude of a ship out of sight of land, and Galileo proposed a method of establishing the time of day, and thus longitude, based on the times of the eclipses of the moons of Jupiter, in essence using the Jovian system as a cosmic clock; this method was not significantly improved until accurate mechanical clocks were developed in the eighteenth century. Galileo proposed this method to the Spanish crown (1616–1617) but it proved to be impractical, because of the inaccuracies of Galileo's timetables and the difficulty of observing the eclipses on a ship. However, with refinements, the method could be made to work on land. After studies in Copenhagen, Rømer joined Jean Picard in 1671 to observe about 140 eclipses of Jupiter's moon Io on the island of Hven at the former location of Tycho Brahe’s observatory of Uraniborg, near Copenhagen, over a period of several months, while in Paris Giovanni Domenico Cassini observed the same eclipses. By comparing the times of the eclipses, the difference in longitude of Paris to Uranienborg was calculated. Oddly, Cassini seems to have abandoned this reasoning, which Rømer adopted and set about buttressing in an irrefutable manner, using a selected number of observations performed by Picard and himself between 1671 and 1677. Rømer presented his results to the French Academy of Sciences, and it was summarised soon after by an anonymous reporter in a short paper, Démonstration touchant le mouvement de la lumière trouvé par M. Roemer de l'Académie des sciences, published 7 December 1676 in the Journal des sçavans. Unfortunately, the paper bears the stamp of the reporter failing to understand Rømer's presentation, and as the reporter resorted to cryptic phrasings to hide his lack of understanding, he obfuscated Rømer's reasoning in the process. Rømer himself never published his results. Assume the Earth is in L, at the second quadrature with Jupiter (i.e. ALB is 90°), and Io emerges from D. After several orbits of Io, at 42.5 hours per orbit, the Earth is in K. Rømer reasoned that if light is not propagated instantaneously, the additional time it takes to reach K, that he reckoned about 3½ minutes, would explain the observed delay. Rømer observed immersions in C from the symmetric positions F and G, to avoid confusing eclipses (Io shadowed by Jupiter from C to D) and occultations (Io hidden behind Jupiter at various angles). In the table below, his observations in 1676, including the one on 7 August, believed to be in opposition H, and the one observed at Paris Observatory to be 10 minutes late, on 9 November. Time is normalized (hours since midnight rather than since noon); values on even rows are calculated from the original data. In comparison, the modern value is circa ​299,792 km s−1⁄29.8 km s−1 ≈ 10,100. Rømer neither calculated this ratio, nor did he give a value for the speed of light. However, many others calculated a speed from his data, the first being Christiaan Huygens; after corresponding with Rømer and eliciting more data, Huygens deduced that light travelled ​16 2⁄3 Earth diameters per second, which is approximately 212,000 km/s. Rømer's view that the velocity of light was finite was not fully accepted until measurements of the so-called aberration of light were made by James Bradley in 1727. In 1809, again making use of observations of Io, but this time with the benefit of more than a century of increasingly precise observations, the astronomer Jean Baptiste Joseph Delambre reported the time for light to travel from the Sun to the Earth as 8 minutes and 12 seconds. Depending on the value assumed for the astronomical unit, this yields the speed of light as just a little more than 300,000 kilometres per second. The modern value is 8 minutes and 19 seconds, and a speed of 299,792.458 km/s. A plaque at the Observatory of Paris, where the Danish astronomer happened to be working, commemorates what was, in effect, the first measurement of a universal quantity made on this planet. In addition to inventing the first street lights in Copenhagen, Rømer also invented the meridian circle, the altazimuth, and the passage instrument (also known as the transit instrument, a type of meridian circle whose horizontal axis is not fixed in the east-west direction). The Ole Rømer Medal [da] is given annually by the Danish Natural Science Research Council for outstanding research. The Ole Rømer Museum is located in the municipality of Høje-Taastrup, Denmark, at the excavated site of Rømer's observatory Observatorium Tusculanum [da] at Vridsløsemagle. The observatory opened in 1704, and operated until about 1716, when the remaining instruments were moved to Rundetårn in Copenhagen. There is a large collection of ancient and more recent astronomical instruments on display at the museum. The museum opened in 1979, and has since 2002 been a part of the museum Kroppedal at the same location. In Denmark, Ole Rømer has been honoured in various ways through the ages. He has been portrayed on bank notes, the eponymous Ole Rømer's Hill [da] is named after him, as are streets in both Aarhus and Copenhagen (Ole Rømers Gade and Rømersgade [da] respectively). Aarhus University's astronomical observatory is named The Ole Rømer Observatory (Ole Rømer Observatoriet [da]) in his honour, and a Danish satellite project to measure the age, temperature, physical and chemical conditions of selected stars, was named The Rømer Satellite [da]. The satellite project stranded in 2002 and was never realised though. The Römer crater on the Moon is named after him. In Larry Niven's 1999 novel Rainbow Mars, Ole Rømer is mentioned as having observed Martian life in an alternate history timeline. Ole Rømer features in the 2012 game Empire: Total War as a gentleman under Denmark. On 7 December 2016, a Google Doodle was dedicated to Rømer. ^ Niels Dalgaard (1996). Dage med Madsen, eller, Livet i Århus: om sammenhænge i Svend Åge Madsens forfatterskab (in Danish). Museum Tusculanum Press. pp. 169–. ISBN 978-87-7289-409-6. ... skipper og handelsmand i Århus, gift med Anne Olufsdatter Storm (død 1690) og far til astronomen Ole Rømer (1644–1710). ^ Friedrichsen, Per; Tortzen, Chr. Gorm (2001). Ole Rømer – Korrespondance og afhandlinger samt et udvalg af dokumenter (in Danish). Copenhagen: C. A. Reitzels Forlag. p. 16. ISBN 87-7876-258-8. ^ Olaf Lind; Poul Ib Henriksen (2003). Arkitektur Fortaellinger/Building of Aarhus University (in Danish). Aarhus Universitetsforlag. pp. 21–. ISBN 978-87-7288-972-6. Ole Rømer tog iøvrigt studentereksamen fra Latinskolen i Århus (Katedralskolen) i 1662. ^ Friedrichsen; Tortzen (2001), pp. 19–20. ^ Niels Erik Nørlund (1944). De gamle danske længdeenheder (in Danish). E. Munksgaard. pp. 74–. ... Maj 1683 gennemførte Reform af Maal og Vægt fastsatte Ole Rømer den danske Mils Længde til 12 000 danske Alen. ^ Popularization and People (1911–1962). Elsevier. 22 October 2013. pp. 431–. ISBN 978-0-08-046687-3. ... letter from Fahrenheit to his Dutch colleague Hermann Boerhaave (1668–1738) dated 17 April 1729 in which Fahrenheit describes his experience at Rømer's laboratory in 1708. ^ A. Sarlemijn; M.J. Sparnaay (22 October 2013). Physics in the Making: Essays on Developments in 20th Century Physics. Elsevier Science. pp. 48–. ISBN 978-1-4832-9385-1. The other, Ole Rømer, was Bartholin's amanuensis, later his son-in-law. ... man, became the Danish king's mathematician (mathematicus regius), professor of astronomy at the University of Copenhagen, and eventually chief of police of that city. ^ Denmark. Udenrigsministeriet. Presse- og informationsafdelingen (1970). Denmark. An official handbook. Krak. pp. 403–. ISBN 978-87-7225-011-3. It was perhaps fortunate that Ole Romer (1644–1710) was called home to Denmark after he had achieved world fame by ... of Copenhagen and oblige him to devote time and energy to thinking out measures against prostitution and begging. ^ Gunnar Olsen; Finn Askgaard (1985). Den unge enevaelde: 1660–1721 (in Danish). Politikens Forlag. pp. 368–. ISBN 978-87-567-3866-8. Det var et held, at Ole Rømer først blev kaldt tilbage til den danske hovedstad, efter at han i Paris havde opnået ... Men at denne geniale forsker som Københavns politimester skulle beskæftige sig med forholdsregler mod prostitution og betleri, ..
^ Axel Kjerulf (1964). Latinerkvarteret; blade af en gemmel bydels historie (in Danish). Hassings forlag. pp. 44–. Ole Rømer vendte i 1681 tilbage til København, hvor han blev professor i astronomi ved universitetet og giftede sig med Rasmus ... justering af mål og vægt, blev ham betroet foruden ordning af byggeforhold, gaders brolægning og belysning. ^ Virginia Trimble; Thomas R. Williams; Katherine Bracher; Richard Jarrell; Jordan D. Marché; F. Jamil Ragep (18 September 2007). Biographical Encyclopedia of Astronomers. Springer Science & Business Media. pp. 983–. ISBN 978-0-387-30400-7. ^ Bobis, Laurence; Lequeux, James (2008). "Cassini, Rømer and the velocity of light" (PDF). J. Astron. Hist. Herit. 11 (2): 97–105. Bibcode:2008JAHH...11...97B. Archived from the original (PDF) on 2009-07-17. ^ Teuber, Jan (2004). "Ole Rømer og den bevægede Jord – en dansk førsteplads?". In Friedrichsen, Per; Henningsen, Ole; Olsen, Olaf; Thykier, Claus; et al. (eds.). Ole Rømer – videnskabsmand og samfundstjener (in Danish). Copenhagen: Gads Forlag. p. 218. ISBN 87-12-04139-4. ^ Point H had occurred about one month earlier, according to Dieter Egger (24 February 1997). "Visualize Solar System at a given Epoch". Archived from the original on 2009-03-22. Retrieved 2009-03-09. ^ a b Saito, Yoshio (June 2005). "A Discussion of Roemer's Discovery concerning the Speed of Light". AAPPS Bulletin. 15 (3): 9–17. ^ Knudsen, Jens Martin; Hjorth, Poul G. (1996) . Elements of Newtonian Mechanics (2nd ed.). Berlin: Springer Verlag. p. 367. ISBN 3-540-60841-9. 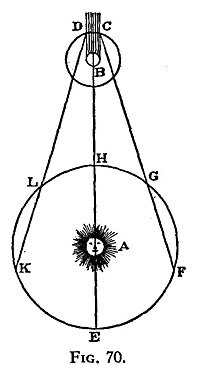 ^ Huygens, Christiaan (8 January 1690) Treatise on Light. Translated into English by Silvanus P. Thompson, Project Gutenberg etext, p. 11. Retrieved on 29 April 2007. ^ Litteraturens Perioder (in Danish). Gyldendal Uddannelse. 2005. pp. 27–. ISBN 978-87-02-01832-5. En af deltagerne i enevældens storstilede forsøg på at skabe orden var Ole Rømer, der ikke blot var ... og i en periode borgmester i København, hvor han bl.a. fik skabt et effektivt brandvæsen og en ordentlig gadebelysning. ^ Bent Rying (1974). Denmark: An Official Handbook. Press and Cultural Relations Department, Royal Danish Ministry of Foreign Affairs. pp. 661–. About the year 1700, the astronomer Ole Romer (1644–1710) displayed considerable technical activities as a public official ... knowledge to improving Danish streets and roads, harbours and bridges, water supplies, street lighting, and sewers. ^ Nederlands Natuur- en Geneeskundig Congres (1927). Handelingen (in Dutch). 21-22. pp. 70–. ... slingeruurwerk van Huygens veranderde de zaak echter, en nu kon Ole Römer, de geniale Deensche astronoom, in 1689 een passage-instrument construeeren, dat in 1704 omgebouwd werd. ^ Nordisk universitets-tidskrift (in Danish). 1854. pp. 6–. ... den længe forhen af den Danske berömle Astronom Ole Römer forfærdigede Cirkel, hvilken han kaldte rota meridiana, ... Ophold paa hans saakaldte Observatorium Tusculanum i Landsbyen Wridslöse-Magte, nogle Mile fra Kjöbenhavn. ^ Historiske meddelelser om København (in Danish). Københavns Kommune. 1936. pp. 316–. Trods Observatoriets nu saa fortrinlige og moderne Indretning synes Rømer dog ikke at have været helt tilfreds med Forholdene. Det er, saa vidt det ... Hvis vi undersøger de fleste af vore borgerlige Indretningers Historie, vil vi støde paa Ole Rømers Navn. ... Hans Elever har sikkert ogsaa observeret baade her og i det andet private "Observatorium tusculanum", som han byggede sig i Vridsløsemagle. ^ Carl Sophus Petersen; Vilhelm Andersen; Richard Jakob Paulli (1929). Illustreret dansk litteraturhistorie: bd. Den danske littterature fra folkevandringstiden indtil Holberg, af C.S. Petersen under medvirkning af R. Paulli (in Danish). Gyldendai. pp. 716–. ... København og Roskilde, sit "Observatorium Tusculanum", som han med en klassisk Vending symbolsk kaldte det. ^ København (in Danish). Gyldendal A/S. 2004. pp. 133–. ISBN 978-87-02-03645-9. Allerede Ole Rømer ( 1644–1710 ) var mere ambitiøs. Han syntes, der var alt for meget lys og røg i byen til, at man kunne se ordentligt, så han byggede sit eget observatorium i Vridsløsemagle langt uden for København. ^ Skalk, nyt om gammelt (in Danish). Forhistorisk Museum. 1999. pp. xiv–. ^ "Kroppedal | Gyldendal – Den Store Danske". Denstoredanske.dk. Retrieved 2015-10-05. ^ Camilla Stockmann (23 November 2014). "Tycho Brahe-maleri er forsvundet" (in Danish). Politiken.dk. Retrieved 2015-10-05. ^ Grethe Jensen; Benito Scocozza (1996). Politikens bog om danskerne og verden: hvem, hvad, hvornår i 50 år (in Danish). Politikens forlag. pp. 253–. ISBN 978-87-567-5697-6. ^ "Untitled Document". Archived from the original on 2007-07-31. ^ Bent Zinglersen (1972). Københavnske gadenavne og deres historie (in Danish). Politiken. pp. 185–. ISBN 978-87-567-1651-2. ^ "The Roemer satellite". Astro.phys.au.dk. 14 February 2001. Retrieved 2015-10-05. ^ Peter Zamarovský (18 November 2013). Why is it dark at night? : Story of dark night sky paradox. AuthorHouse. pp. 157–. ISBN 978-1-4918-7881-1. ... the homeless and prostitutes. In 1705 he became mayor of Copenhagen and a year later, Chairman of the Danish State Council. He died shortly before his sixtieth birthday. The Römer Crater is located in the north-east section of the Moon. ^ "Rebuilding Civilization: The Ultimate Time Machine 1: The Cosmic Treadmill". rebuildingcivilization.blogspot.dk. ^ "340th anniversary of the determination of the speed of light". Axel V. Nielsen (1944). Ole Romer, en Skildring af hans Liv og Gerning (in Danish). Nordisk Forlag.